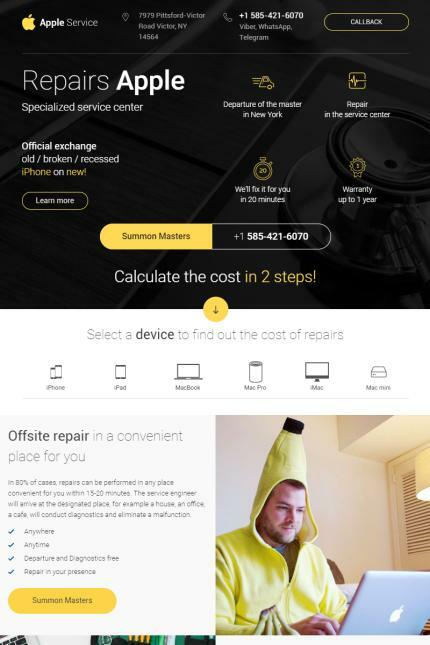 Responsive bootstrap template Apple service. There are two templates: jquery and vuejs. A convenient template with a choice of device, model and type of failure. It looks great on all kinds of devices. Calculator of the approximate cost of services and order forms. Callback popups (Included php files for sending mail). All information about the devices is taken from the json file, which you can generate on your server. Images are used for promotional purposes only and not included in the pack. This template was crafted for jewelry, business and services, design and photography, real estate, medical, education and books sites.